The first film – Beethoven’s Fifth – won a Raindance Film Festival Award for Best VR Music Experience in 2017. Commissioned by Google Daydream in partnership with NASA, it commemorates the launch of the Voyager 1 spacecraft in 1977 which became the first human-made object to leave the solar system and is still travelling today. Mounted to the spacecraft is a gold-plated phonograph record, featuring images, recorded greetings, and the Philharmonia Orchestra playing the first movement of Beethoven’s Fifth Symphony. The film which cuts together scenes from interstellar space along with footage of Salonen, is directed by leading VR filmmaker Jessica Brillhart. The Philharmonia Orchestra has been at the forefront of technology, since its inception in 1945 to capitalise on the then revolutionary development of recorded music. The Orchestra continues to remain a pioneer by creating cutting-edge digital projects to nurture interest in orchestral music and build new audiences. 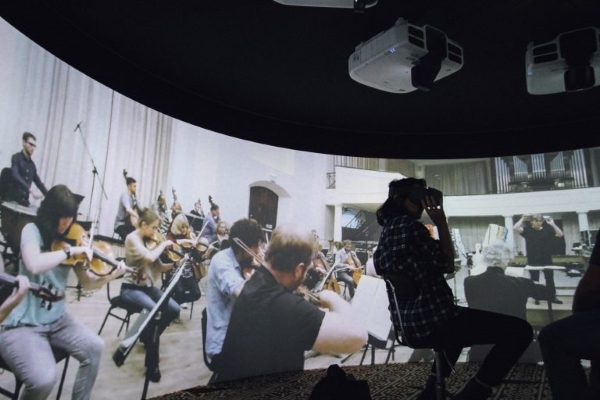 Their large-scale digital productions RE-RITE and Universe of Sound have been putting people at the heart of a symphony orchestra for years and VR is the next step in this concept. The Orchestra began experimenting with it in early 2015, and has now worked on three public VR projects to date – The Virtual Orchestra (2016), Beethoven’s Fifth (2017) and Mahler’s Third (2018). The Orchestra’s in-house Digital team have also worked with some leading technology firms to develop their VR projects, including Sony and Google, with whom they are now formal partners. This speaker system is at the core of the VR Sound Stage, coupled with a bespoke software system created by the Philharmonia Orchestra, which allows multiple VR headsets to play in sync to the ambisonic audio playing through the large speaker array. During the showcase at the Royal Festival Hall in London between 27 – 30 September 2018, the speaker array will be concealed inside a beautiful 8K projection cylinder, created by British company Igloo Vision (https://www.igloovision.com), who are world leaders at shared VR experiences. Igloo Vision worked as a partner with the Philharmonia during the premiere of Beethoven’s Fifth at SXSW in March 2018. This projection cylinder will itself be hidden within a soundproof 7m x 7m ‘black box’. Southbank Centre are a key long-term partner for the Philharmonia Orchestra, who are one of the Centre’s resident orchestras. This will be the third year in a row that a Philharmonia VR film will be presented alongside the start of the Classical season. Google have been a key partner for the Philharmonia during the creation of their last two films. Beethoven’s Fifth was commissioned and produced by Daydream, directed by Jessica Brillhart, who was Principal VR Filmmaker for Google at the time. Mahler’s Third was only made possible through several partnerships. Google Arts & Culture, with whom the Philharmonia Orchestra is now a partner. This allowed the Orchestra to use a Google Jump Odyssey VR camera to film the performance in October 2017. Post-production and stitching for Mahler’s Third was provided by Satore Studios (http://satorestudio.com/), a leading creative VR company based in London.